Black Bass were first introduced to waters in South Africa in the 1920's when the first Largemouth Bass were imported to the country. Smallmouth Bass were introduced in the late 1930's, their descendants have thrived and expanded. For Bass fanatics this is great news with some world class Bass angling to be had throughout the country. Each lake, dam or river includes all the information that Bass anglers might require to make the most of their precious fishing time as well as accommodation options where they are available. Select a province below or click on a region on the map for Bass fishing venues in that area. 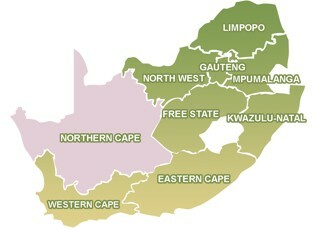 Comprehensive listing of public and private bass fishing venues in the Eastern Cape. More info . . . The Free State province doesn't have numbers of bass lakes but it does have size. More info . . .
Gauteng is well provided for when it comes to Largemouth Bass fishing waters. More info . . .
Public and private bass fishing venues in Kwazulu Natal. More info . . .
Limpopo, the Northern most province in South Africa offers some excellent Bass fishing. More info . . . Previously known as the Eastern Transvaal, Mpumalanga is well endowed with Bass fishing lakes. More info . . . 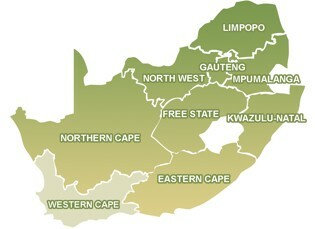 The Northwest province is in close proximity to Gauteng and has excellent Bass fishing potential. More info . . .
Comprehensive listing of public and private bass fishing venues in the Western Cape. More info . . .